December 15, 2011 by Ken Ward Jr.
More than 20 years ago, Congress ordered the Environmental Protection Agency to regulate toxic air pollution. It’s done that for most industries, but not the biggest polluters — coal and oil-burning power plants. … When President George W. Bush took office, the power industry persuaded his EPA to adopt soft limits on mercury, but federal courts said that regulation was too weak, so it never went into effect. They’d also have to slash arsenic, acid gases and other pollutants that cause premature deaths, asthma attacks and cancer. But even now, some power companies have been furiously fighting the EPA’s rule — especially its deadlines. In West Virginia, AEP has said it would shut down Appalachian Power Co.’s 1,105-MW Philip Sporn plant in Mason County and 439-MW Kanawha River plant in Kanawha County, along with Ohio Power Co.’s 713-MW Kammer plant in Marshall County. The plants represent more than 2,200 megawatts of coal-fired generating capacity in the state and about 240 jobs. They accounted for about 7 percent of coal burned for power in the state in 2010 — not all of which is West Virginia coal. However, because they are old and inefficient, they accounted for only about one-tenth of one percent of West Virginia generation, according to the Energy Information Administration. Asked whether these old plants wouldn’t be closing anyway, Appalachian Power Co. spokeswoman Jeri Matheney said they would, but not all together and so quickly. Mercury is a neurotoxin to which fetuses and children are particularly susceptible, while other targeted emissions cause cancer, chronic and acute respiratory disorders, and other illnesses. The rule will require expensive upgrades to or installations of new emissions controls by Jan. 1, 2015, at an estimated 1,200 coal-fired units and 150 oil-fired units at 525 power plants. When the agency issued its proposed rule in March, it estimated the 2016 cost of compliance at $10.9 billion. The 2016 benefits — realized primarily through 6,800 to 17,000 premature deaths avoided but also through the avoidance of 11,000 non-fatal heart attacks, more than 300,000 cases of respiratory illness including aggravated asthma and acute and chronic bronchitis, and 850,000 days of missed work — came to $59 billion to $140 billion. Environmentalists are getting word that the White House may relax the EPA’s planned new rules on mercury and other toxic chemicals. 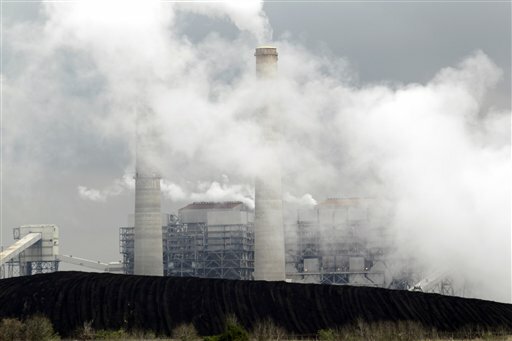 Since a lot of your postings are about U.S. power plants and U.S. rules that will be enacted, could you get rid of the picture of the Chinese power plant that is obviously emitting lots of smoke and who knows what else. I realize that it doesn’t fit your agenda to show a picture of a clean burning American power plant, but the picture that you include with all of your postings is disingenuous. Fair point, BG. I’ve swapped that photo out for the one above, of a power plant in the United States. I included the original Associated Press caption, which identifies it in more detail. Ken. At least it’s an American plant. Although the cooling towers that are producing all the STEAM are not visible in the shot. But I understand the agenda. Since all the toxic pollutants are invisible, photographers have to invent a shot to pull at the heartstrings. It just smacks of false advertising, but I’ll get over it. I thought you said American plants were clean … now you say there are toxic pollutants? Perhaps you misspoke.